--Midwesterners, is it ever going to stop raining??? Wow, what a soggy, sticky August this has been! 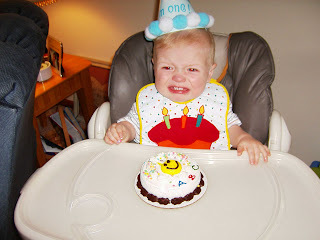 --The pictures posted are of "B" at his birthday party. 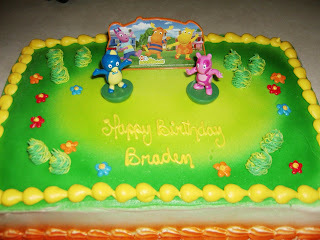 Since Braden loves music, we went with a Rock 'n' Roll theme with his favorite cartoon cake, The Backyardigans. 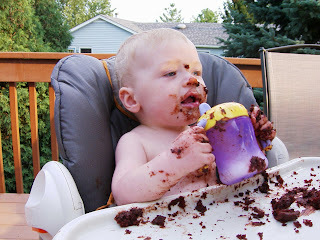 Braden was a bit overwhelmed with all of the people, and didn't do the cake dive like he did with the cupcake. 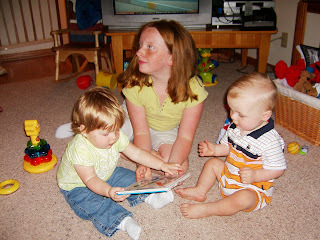 One of the pics show Braden sharing his favorite ABC book with cousins Chloe and Amy. 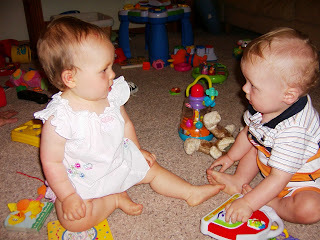 Another shows him sharing some playtime with cousin Morgan as well. 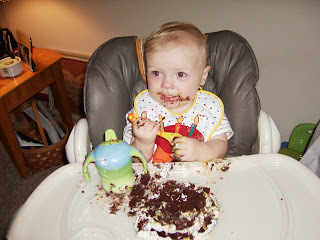 We had a great birthday celebration with Braden, and we thank all of our family who helped us celebrate this milestone! --Braden updates: Braden weighed in at 22lbs and 30 inches in heigth on Monday. We asked about the slight decrease in weight since last month. It could be anything from a poop (he didn't have last time and/or he did have this time) to the crazy amount of energy he burns everyday moving, moving, moving! She was not concerned and neither are we....he's in the 50th percentile for height and weight and a whopping 75th percentile for his head. He is now dancing, which is hysterical. He has a new little Zebra (thanks to Auntie Marci) that he can ride, but he chooses to hang onto the reigns, flick the music on, and dance (head moves and all). No attempt to walk yet, but he can stand on his own. He's babbling up a storm, and Grandma Lois just taught him where his hair is. When you ask him where his hair is, he'll grab his hair and play with it....too funny! --Yesterday was a bitter/sweet day for us. It was Rich's first day back to school with kids and my first day back for teacher institute day. The start of last year's institute day marked just 8 hours after Braden entered this world. I was not there (obviously), but Braden's birth was proudly announced to the staff that day. Yesterday also marked a year to the date of Braden's first open-heart surgery - a day we will never forget and always remember as the most precious gift given to him, LIFE. Although, it's hard to say good-bye to "B" again, yesterday was a day we embraced as it marked a true milestone for our family. Rich and I got to start this school year without a heavy heart, praying over a mending one. 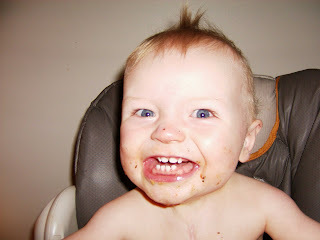 Instead, we long to see the smiling, happy, dancing, babbling little boy who is thriving and growing everyday. --AND, so the year-to-date-memories begin. I could go on to let you know that a year from tomorrow morning, his chest was closed....a few days later, extubation #1 was attempted, etc. I won't do this as it takes away from the joy we celebrate with Braden today. We will always remember those precious moments and keep them tucked safely into memory, but sharing them will only be on occasion. --One more thing....another memory....one we proudly remember everyday....the overwhelming amount of support we received. We will alway be grateful for you and your generosity, thoughts and powerful prayers. Thank you, thank you! PS.. Sorry blog-a-holics, but with a highly-energized one year old, we can no longer promise weekly postings...we'll try like heck though to post when we can !!! 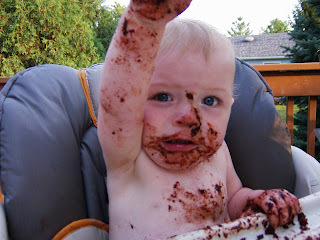 Today is the day....the celebration of Braden's first birthday. Today, we not only celebrate life, but so much more. We celebrate a year of miracles, the devotion of life-saving doctors and nurses we proudly name our heroes, the advancement of medicine, the beauty of family and friends who surround us with love and support, and of course the little boy who wears his badge of courage each and everyday expressing true happiness with his big, bright, tooth-filled smile! Although Braden will never remember the courageous battles he fought, he will always be reminded of the devoted army of supporters who cheered his way to victory. Although the war is not over, we feel peace in knowing God has special plans for Braden. 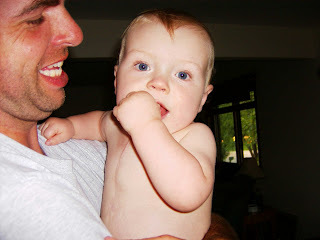 He has already given Braden the determination and tenacity to fight so hard during his first year of his life. As we enjoy the present (a precious gift), we anxiously embrace the future God has planned for him. Thanks again for allowing us to share this first year of parenthood and all of the bumps and blessings along the way. PS...these are pics of today - a good morning Happy Birthday; special dinner with mom & dad; mmmmm chocolate cupcake; all cleaned up & ready for bed!! We're having a family party on Sunday to continue the celebration! Sorry for the delay in the update, but this family was a bit pooped out from the weekend. What a day...what a weekend! 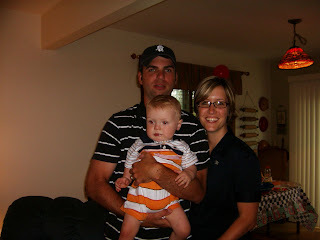 First off, our company started on Thursday when Auntie Marci arrived followed by Cousin Terri, Jay and little Ivan. On Friday, the rest of our company arrived, and we had close to 20 people sleeping at the house....tent in the backyard, camper in the driveway, and miscellaneous bodies strewn all over the house.....we wouldn't have had it any other way! On Saturday, it finally hit me when I was walking Braden over to the golf course that this was our day....finally here.....to serve a wonderful purpose. It was quite an emotional day as we witnessed a tremendous amount of support from our family, friends, co-workers, and even strangers. God's presence was definitely evident throughout the entire day. We ended up with 144 golfers (sold out) along with an additional 120 dinner guests. WOW! We can't thank those who attended enough for coming to support this beautiful cause. It was defnitely one of the proudest moments of our lives, and we were able to share it with so many people who care about Heart of Gold's mission. We hope to have pictures up soon of the event. 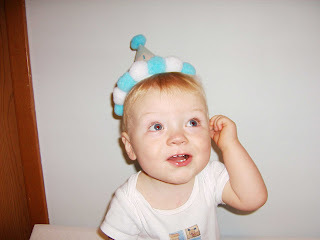 Braden's birthday is this Friday....so hard to believe our baby boy will be reaching this milestone. I may just have to post something on Friday to honor this blessing. I will close this post with my speech from Saturday. I think it's appropriate to repeat as it acts as a reminder of our mission and our gratitude to the amount of support we received this past year. 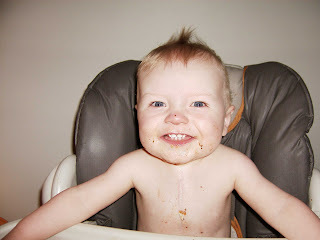 As most of you know, Braden was born with Hypoplastic Left Heart Syndrome, a very rare and serious heart defect where the left ventricle of his heart did not develop. When told the news two days after he was born, it was our worst fears come true. In that one moment, those few seconds it took to explain the underdevelopment of his heart, the pause button was pressed on our lives and for the next few weeks we would be living in a whole new world….. a world full of hope, promise, and healing a special little heart. Hope is defined as: A wish or desire accompanied by confident expectation of its fulfillment. On the day of Braden’s first open-heart surgery, Rich and I arrived at the hospital quite early to say our good-byes and to kiss his sweet little chest before he was taken to surgery. The Chaplin joined us just shortly after we arrived to lead us in prayer. Just as the special prayer was about to begin, we could see the sun rising and shining right onto his precious little face. It was a peaceful moment – a moment we knew God was telling us he would carefully watch over Braden and keep him protected. Hope was gained and our spirits were renewed with the strength we needed to get through each passing day. Promise is defined as: an indication of future excellence or achievement. From the moment we found out about Braden’s heart, we accepted that this was the path God chose for Braden and ourselves. I knew that if my Grandma Pat was alive she would tell me, “Tuffy, God chose you and Rich to be the parents of this precious little boy because he knew you would love him, care for him, and fight for him.” We know God has special plans for Braden and we embrace his future, aware there are risks but living each day with hope and optimism by our side. Braden’s unique heart has lead us on an amazing journey. We have met so many wonderful people who have truly enriched our lives. From the medical staff at Children’s Hospital to all of the wonderful heart families whose paths we have crossed. We have seen the true spirit of friendship, the generous gift of giving, and the tremendous power of prayer. Our determination, optimism, and strength is renewed each day by Braden’s presence. With the help of this charity, our mission is to pass on our strength and courage to other families who walk in our shoes. As we continue our journey in fulfilling our mission, we will remember those who came here today, we will remember those who have lent us a helping hand…as our charity would not be possible without you. So thank you. Thank you for helping us make it possible to instill hope and promise in healing the hearts of these special families. --Another week has flown by and it's less than a week away from the fundraiser and only 12 days from Braden's first birthday. It's amazing how fast this year has flown. Planning and organizing this fundraiser has been a great way for Rich and I to absorb as much positive energy as we can into something that has changed our path in life. As we can't imagine Braden being any different than who he is now, we can't see any other way we'd focus our energy than in a positive way. We're so fortunate to have so many people who have supported us and helped us with our charity efforts....we wouldn't be here without you! --This weekend Braden and mom met up with heart pal, Super Sam, and his mom to have a playdate at the Milwaukee Zoo while dad and Grandpa Harvey worked hard to finish up some last minute house projects. 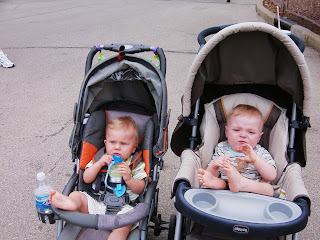 It was fun to see the boys make funny faces at each other and enjoying some of the animals at the zoo. Of course, Braden's a little young to spot some of the smaller and hidden animals, but he loved the elephants:) This also gave Erika and myself a chance to catch up and share stories of the boys and their latest "tricks." We look forward to seeing the Slagers next week at the fundraiser. 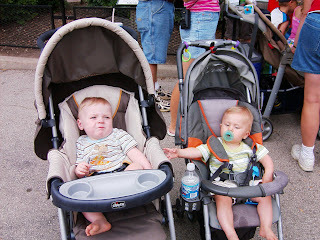 --Here are some pics of Braden at the zoo with pal, Sam. 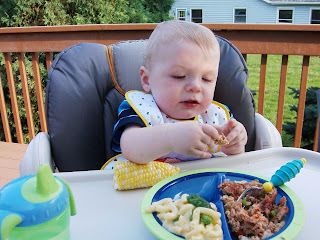 The other pic is a classic one of Braden during dinner. 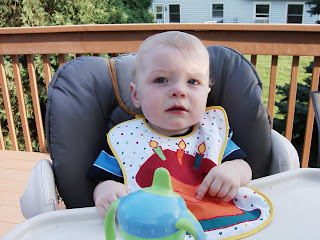 I guess he's too cool now for mom to feed him....he'll spit out his food into his hand and re-feed himself. This, of course, leaves a nice little mess to clean up :) His latest new trick is what daddy calls "piggy face 2.0" This is where Braden puts his hand up to his nose to pinch it off and make a snorting sound.....too funny! --Heart buddy update: Thanks to all of you who have kept our special friends in your prayers. Gabe is home....yeah! No changes with Maddison....I'll keep you posted when they update with any surgery details....for now, she's able to stay home, gain weight and allow her heart to grow. Carter and the Solgos family will also be joining us on Saturday for the golf outing. 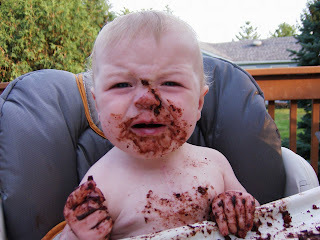 Also, at this time, we'd like to wish our little pal Evan G. a happy first birthday! --Our number of golfers along with additional dinner guests keeps increasing....yeah! We might have over 200 people attending our fundraiser....WOW! If you're still interested in golf or dinner, please contact us at heartofgoldcharity@yahoo.com so we can reserve you a spot. --Enjoy your week and we'll be excited to update next week with all of the fundraiser fun!